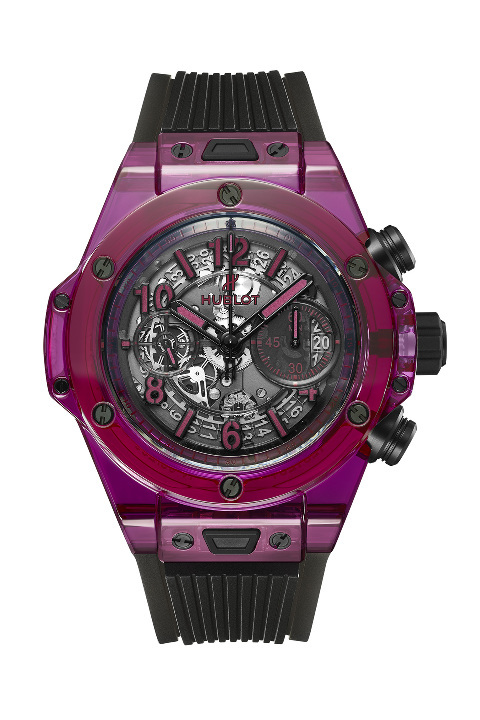 For Hublot, it seems there are no limits when it comes to colour. Its application brings depth and distinction to materials. Hublot has now fused sapphire and metals to create a Big Bang case in blue sapphire — marking the first time this colour sapphire has been used in watchmaking. 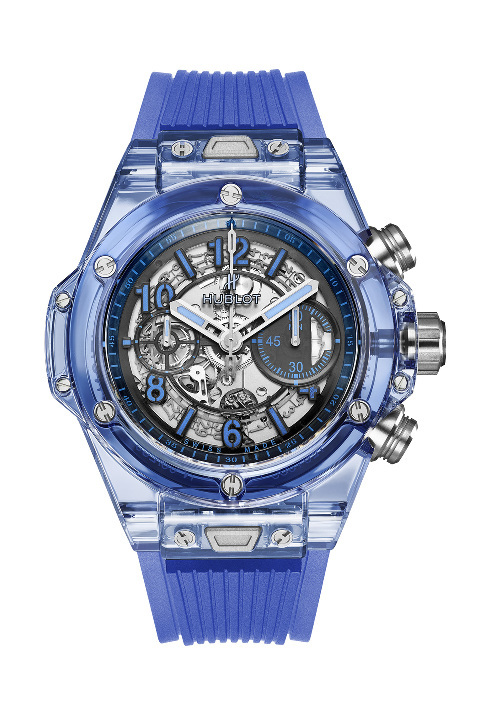 The Big Bang Unico Sapphire made its name in 2016 as part of the sapphire revolution. A year on from this world’s first, the Nyon-based manufacture is celebrating another in the context of its tireless pursuit of innovation and R&D. 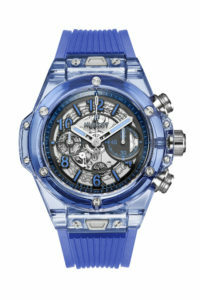 In a tour de force, Hublot cut a sapphire case on an unprecedented scale, mastering a complex material, which is both ultra-resistant and totally “invisible” thanks to its transparency. The Nyon-based watch manufacture and its Metallurgy department are constantly innovating and breaking new ground, with the rewards for its pioneering spirit revealed in 2017. While coloured synthetic sapphires have been in existence since 1902, when they were invented by the French chemist Auguste Victor Louis Verneuil, melting sapphire is a complex and unpredictable process. Because its crystallisation process is unstable, it is difficult to obtain similarly coloured sapphires, even if they are produced simultaneously. Furthermore, bubbles and cracks can appear in the material, making the end result unsuitable for producing Big Bang cases. But the main challenge is in the size. Thus far, no coloured sapphires exceeding 2 kg have been produced. 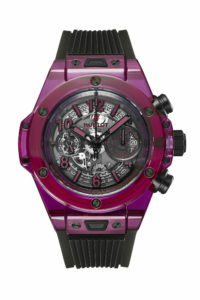 However, Hublot has now gone beyond this threshold. By pushing the limits of engineering and chemistry, it has developed a sophisticated and costly process that has resulted in the successful production of a large, transparent sapphire of perfectly uniform colour. 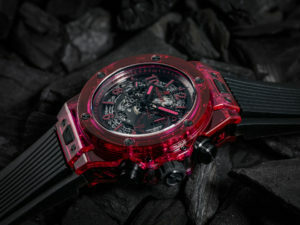 Hublot melted iron (Fe) with aluminium oxide. The result is a coloured sapphire that retains all the original properties of a material which is ultra-scratch resistant, completely transparent and among the hardest in existence. The innovation extends to the colour — the first blue sapphire in the history of watchmaking. Case middle, bezel and case back cut from blocks of blue coloured sapphire. Flange, indices, Arabic numerals and hour/minute hands toned to match the colour of the sapphire, through contrast revealing the mechanism of the Unico HUB124 proprietary movement and its column wheel on the dial side. 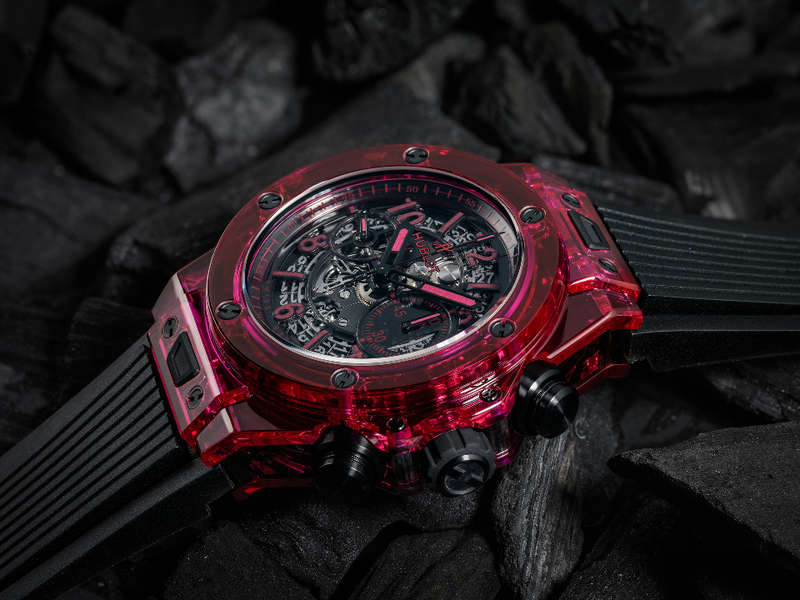 Hublot has also designed a series of 250 pieces in red sapphire by heating aluminium oxide (Al2O3) — the raw material for sapphire — with a transition metal, chromium (Cr), at a temperature of between 2000 and 2050 degrees Celsius.